Fruit flies protect their eggs by laying them in alcohol-laced fruit, but only when there are parasitic wasps around, new research has revealed. So-called endoparasitic wasps lay their eggs in the larvae of other insects. 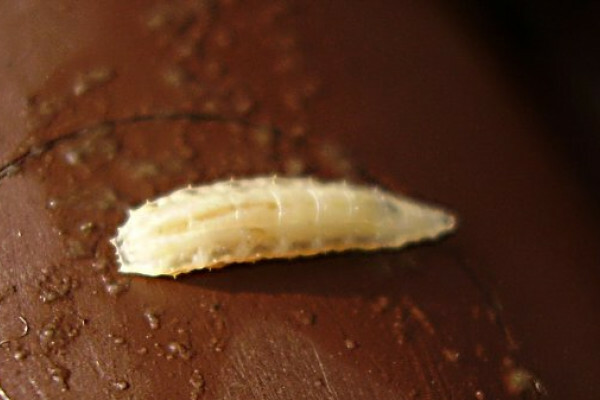 After they hatch, the wasp larvae then live off the fly larvae, devouring them from the inside out. Infected flies combat the threat by switching to a diet of fruits that are naturally much richer in alcohol, which has the effect of killing off the wasp developing inside them. But now scientists have shown that they also sidestep these parasites in another way. Emory University researcher Balint Kacsoh and his colleagues have shown that, when there are parasitic wasps around, adult fruit flies prefer to lay their eggs in alcohol-rich food sources, achieving significantly better survival rates as a result. It seems that flies have evolved to recognise when their offspring will need to self-medicate with alcohol, and so lay their eggs in a food source that leaves them in the best position to do so. But when there are no wasps around, the flies choose lower-alcohol locations for their eggs and achieve even higher survival rates. The flies identify the wasps by sight, the team found. Flies genetically engineered to be blind did not switch to the alcohol-laden fruit when the wasps were around. The memory of spotting a wasp also remains with the flies for some time, and they continue to prefer alcohol-rich sites for the eggs for around 4 days after each wasp encounter. This suggests they form long term memories and use these to determine laying choices. In further tests, flies engineered to lack a protein needed for long term memory formation reacted normally when exposed to wasps, but didn't retain the memory like normal flies did - they switched back to laying in the non-alcoholic food as soon as the wasps were no longer around. Interestingly, the flies could also tell the gender of the wasps, and only switched to the alcoholic laying dish when there were female wasps in the area, as only female wasps can lay eggs, and therefore harm the fly larvae. There are some kinds of wasp that lay eggs on fly larvae, and others that only infect the fly once it has started to pupate. There is no way for the adult fly to protect her offspring from the wasps that infect the pupae because the larvae are likely to have moved from their original food source by the time they pupate. Cleverly, the flies were able to tell the difference between these two kinds of parasitic wasp, and only lay eggs in alcohol when the larvae-infecting wasps are around. So if you are a fruit fly larvae at least, a little booze can definitely be a good thing!